fototazo: The Image: Ben Roberts, "Scadbury Park Nature Reserve, October 2011"
The Image: Ben Roberts, "Scadbury Park Nature Reserve, October 2011"
Ben Roberts: Like many British people of my generation, I was a suburban child; I grew up in a small commuter village called Curdworth, separated from Birmingham (the UK's second largest city) by a mile of farmland. As the years passed, I witnessed the gradual spread of the city and its influences. When I was 5-years-old, the horse pastures to the east of my infant school, that stretched for miles into rural Warwickshire, were dissected by a four-lane motorway. This paved the way for a drip feed of development; small retail parks, warehouses, and eventually a BMW factory, a depot for Channel Tunnel cargo trains, and the widening of the aforementioned motorway to 14-lanes. The green spaces of my childhood still exist, but have now narrowed; trees and foliage battle for territory with factories and thoroughfares. While the slow creep of the city can seem relentless, nature is innovative and a survivor. New habitats spring up in unlikely places, while moss and weeds swiftly populate manmade surfaces left for too long. In spite of the sometimes rapid development that occurs on the fringes of cities, there is a certain timelessness that can embed itself in housing estates and woodlands that remain relatively untouched. Whisked in on high-speed railways and elevated motorways, tourists and commercial visitors glimpse the tops of houses and flashes of suburban back gardens. Whole neighbourhoods are bypassed in seconds. For the last three years I have been making work on the fringes of London. I've been described (by Sean O'Hagan in The Guardian) as "the documentary photographer as flaneur" – it's a remarkably accurate description. My working practice takes me on long, meandering walks through the woodlands and scrublands that nestle in between the industry and arteries of England’s capital city. The photographs, under a working title of "The Seventh Zone" – are slowly constructing a poetic representation of the ecology of the edges, both in human and physical terms. I made this particular photograph in early October 2011 – the UK was experiencing one of its brief "Indian Summers" as temperatures rocketed to 29˚C. My walk that day took me from Petts Wood heading northeast through Sidcup and Foots Cray, and finished in Bexley Heath. As I ambled through Scadbury Park Nature Reserve, I saw this scene playing itself out in the woodland to my right. 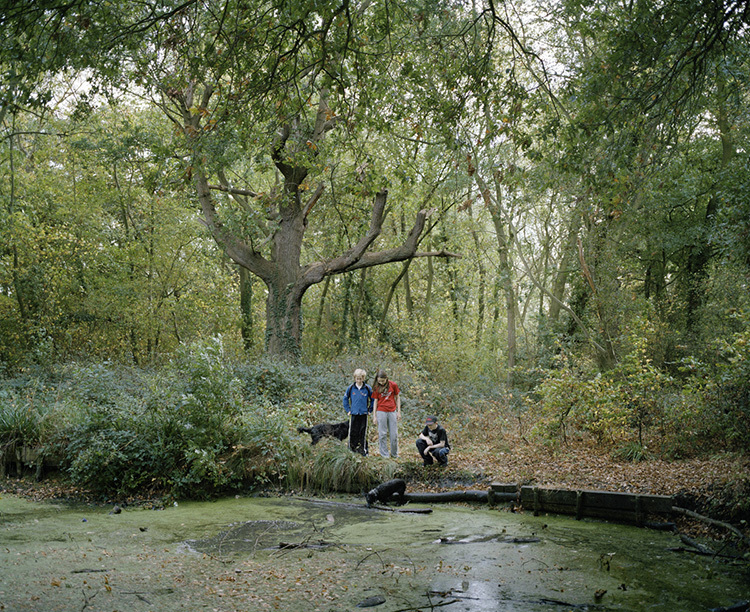 I asked the three children if I could photograph them from the other side of the pond; they agreed, but aware that my presence might disturb the natural feeling of the scene, I sat on the other bank and waited until they had lost their self consciousness and were absorbed in the play of their dogs who were jumping in and out of the algae-ridden pond. Several weeks later, going through my contact sheets, I experienced a compelling sense of familiarity when I lingered over this image; of summer days spent exploring the tangle of waterways, woodlands and ageing sewage beds that surrounded my village. The territorial occupation of local pockets of woodland and open space by local children is a characteristic of the suburbs that will resonate with anyone whose upbringing took place on the urban fringes. The grand scale of the ancient oak trees, dwarfing the children in the foreground, infuses the image with a timelessness belied only by the logos on the children’s clothing. My work on London's outskirts is approaching a midpoint; I have approximately 25 miles left to walk before I have completed a circuit of the city's perimeter. Once this has been done, I'll be taking some time to assess the threads and narratives that are taking shape through the photographs. And then? Most likely a return to the fringes, to follow more quiet footpaths and driveways. Photography for me is a slow, contemplative process, punctuated by chance encounters and evocative scenes. The gradual assembling of photographs into something whole is intensely rewarding. So while this particular image evoked strong feelings for me, ultimately it will be one small element in a wider tableau.